I have rework and edit the US 50 & CA 99 map mod by seal0027 so it is now working with the new 1.6 patch (1.20 scale) and the Project West 1.3.2 map mod too! You will NEED to have Project West 1.3.2 if you want to play on this map mod! 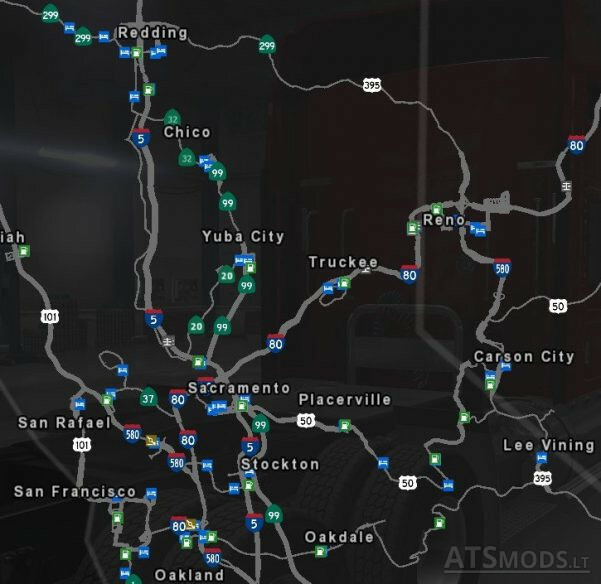 Place the US 50 & CA 99 map mod above the Project West 1.3.2 in the mod priority to make it working. Compatible with C2C and Project West! Please reupload link, all I get is it trying to connect when I click on the download file button. Good map extension. At least a short cut from Carson City, NV, to Stockton, CA. Nice that I can travel between Stockton to Sacramento vise versa on CA-99 besides using I-5.